To qualify for the e-Lucky Draw, spend a minimum of $10 at any participating stores. Complete the e-form and upload your receipt via this link. Contest closes 12 Aug 2018, 10pm. Jubilee Square is owned and managed by Eng Wah Global Pte Ltd. Eng Wah Global Pte Ltd is not an agent of the merchants and makes no representation as to the quality of goods and services provided. Eng Wah Global Pte Ltd and all merchants reserve the right to amend these terms and conditions or substitute any of the prizes without prior notice. Eng Wah Global Pte Ltd respects your privacy. In line with the Personal Data Protection Act (2010), the particulars that you provide are to enable us keep you updated of results of the contest, brand promotions, events, and news-related messages. 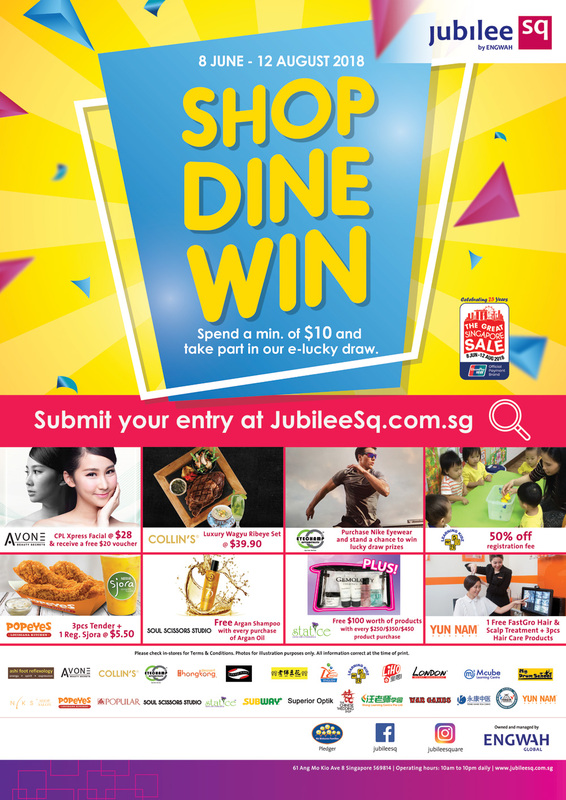 By participating in Jubilee Square’s e-lucky draw, you consent to Eng Wah Global Pte Ltd contacting you through calls, SMS messages, e-mail and mail, and you consent to Eng Wah Global Pte Ltd capturing your image for publicity purpose. Participants must be responsible for providing complete and accurate contact information to Eng Wah Global Pte Ltd. Eng Wah Global Pte Ltd accepts no responsibility for any inability or failure to contact the participants.